Harley-Davidson has shown off its first all-electric motorcycle, dubbed Project LiveWire. The electric hog is part of the legendary motorcycle maker's attempt to expand beyond its traditional market of leather clad biker gangs and middle class men going through a mid-life crisis. 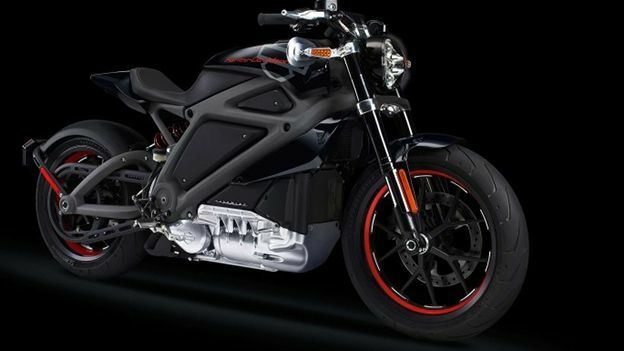 Harley Davidson has designed the ride to fit in with its traditional image, while using the latest technology Project LiveWire's electric motor is packed into a polished case beneath the frame in a casing that is reminiscent of its gas-powered predecessors. The company is also promising “an unmistakable new sound”. From the press video (below) that new sound is like that of a jet powering up on an aircraft carrier, combined with the noise of the tyre tread being eaten up by the road. Harley Davidson hasn't released any specs, but according to Wired, the demo unit has 74bhp and is limited to 95mph. It is also said to have a range of 53 miles and can charge in three and a half hours. Other tech gadgets include LED lighting throughout and a touchscreen interface for the rider. If you fancy getting hands on with the electric bike, Harley Davidson is taking it on tour this summer. Fans will be able to ride the bike at any of 30 stops along its “Experience Tour”. It'll be stopping off at various Harley Davidson dealerships along Route 66 and throughout the US and Canada. It'll also be coming to this side of the Atlantic, but there's no date for it yet.